A jury should hear the inquests into the deaths of Princess Diana and Dodi Al Fayed, the High Court has ruled. Harrods boss Mohamed Al Fayed won a ruling overturning deputy royal coroner Baroness Butler-Sloss's decision that she would sit alone. 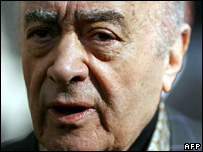 Three senior judges said the inquests should be heard by a jury, a decision Mr Al Fayed said was a "good victory". The princess and Dodi died in 1997 in a road crash in Paris. Their inquests are scheduled to start in May. Speaking after the ruling, Mr Al Fayed said: "It's a good victory but it's just the start of my battle for the last 10 years to find justice." He called for senior members of the Royal Family, Prince Philip and Prince Charles, to take to the witness box. 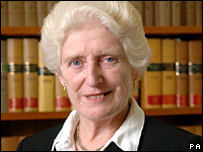 In an earlier ruling, Lady Butler-Sloss said only a coroner could give the "careful and fully reasoned decision" the inquests required. But on Friday, High Court judges ruled against her. They said their main reason for quashing her decision not to sit with a jury was that the Diana case occurred in circumstances which, if repeated, could be "prejudicial to the safety of sections of the public". In such cases the coroner must summon a jury, according to the law. They referred to reported similarities between the treatment by the paparazzi of Kate Middleton, Prince William's girlfriend, and Diana. A jury was the appropriate body to make recommendations for changes to the law to stop similar harassment of royalty and celebrities in the future, the judges said. They also ruled Lady Butler-Sloss should not sit as coroner to the Royal Household. She will still hear the case - but as Westminster Assistant Deputy Coroner, Westminster City Council said on Friday. This is the second successful challenge for Mr Al Fayed, who earlier persuaded Lady Butler-Sloss to hold a preliminary hearing in public, rather than private. She was said to have changed her mind because of public interest in the case. Clarence House declined to comment on the High Court ruling saying it was a matter for the courts, but pointed to a letter written to the court on behalf of Princes William and Harry. They wrote that they wanted an open and fair inquest that concluded swiftly. The campaign group Inquest said having a jury could help to reassure the public and put to rest controversies. It added there was evidence that juries could follow complex arguments. A pre-inquest hearing is due to take place on 5 March. The two inquests planned for May, will be held concurrently. The princess, Dodi Al Fayed, and driver Henri Paul died when their Mercedes crashed in the Pont d'Alma tunnel in Paris on 31 August 1997. They were being pursued by photographers after leaving the Ritz Hotel for Mr Al Fayed's apartment.